Can you catch a minute? A monkey chases a minute in the rainforest in this clever, funny, and informational story about the concept of time from Michael Hall, the New York Times–bestselling and acclaimed author of Red: A Crayon’s Story. 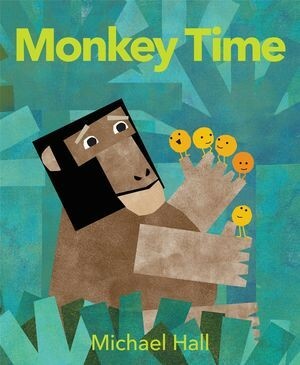 Monkey Time stars a silly monkey and sixty minutes, and it is perfect for fans of Mo Willems’s Waiting Is Not Easy! and anyone learning about how time passes. Look for surprises in the pictures on every page! Meet monkey. Monkey is very curious about the brightly colored—and very tasty-looking—minutes on the minute tree in his forest. But can he catch one before it disappears? Playful, educational, and entertaining, this brightly illustrated book reinforces simple counting skills while introducing children to basic concepts about time, how time passes, and how time is measured. With illustrations full of engaging animals and a call-and-response text, and loads of rhythm, repetition, and humor, this is a great choice for family and story-time sharing.